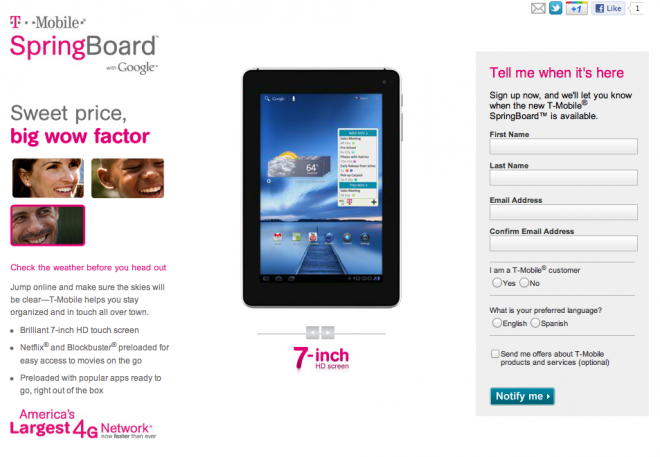 Looking to stay up to date with future information surrounding the release of the T-Mobile Springboard tablet? I thought so and to help you out T-Mobile has posted a sign-up page to help keep you informed and “tell you when it’s here.” Of course you’ll likely find out the release date long before T-Mobile officially informs you but no harm in wanting to stay in the loop. The Springboard is rumored to be T-Mobile’s most affordable tablet with a sub $200 price point so this is definitely one to keep an eye on. I bet a wifi version of this would be quite affordable. The big question is how well does it perform? Because this is a “with Google” device, is it pretty much straight Honeycomb? No TouchWiz or Sense type layer? This device should do pretty well..$99 on contract maybe. This is interesting a Chinese knockoff of a Korean knockoff for under $200. Wow tmobile just keeps expanding its line of original high quality devices that the customers really want. I can’t imagine with all these stellar devices why DT has such little faith in tmobile’s future profitability. $200 on contract. More than likely $400-600 off-contract. I’ll stick to my Xoom.